Recently I was admiring a beautiful apricot tree in Center City loaded with soft orange apricots, but the apricots were swarming with yellowjackets. Gardeners have a love/hate relationship with yellowjackets -- they are know for their beneficial predation on many harmful insect species and their nasty habit of getting aggressive if disturbed. What are yellowjackets and how should we, as gardeners, take advantage of their good side and avoid their dark side? Yellowjackets are social wasps that live in colonies of males, workers and queens -- very similar to the social arrangements of honey bees to which they are distantly related. Only the queens overwinter, and when they emerge in the spring, they establish a new colony in a small paper nest which she builds. Soon the colony starts to grow rapidly, and by the end of summer may contain 4,000 to 5,000 wasps. This is why yellowjackets become so common in late summer, and also the reason why they become more aggressive, especially as food shortages start to occur in the fall. Then yellowjackets start showing up at outdoor picnics, on garbage cans, and on fallen fruit. There are several species of social wasps that are commonly called yellowjackets. 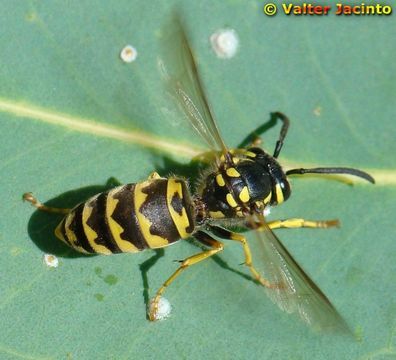 The common wasp and the German wasp are European species that are now fully established in North America.The eastern and western yellowjacket and several others are native species. They all look quite similar and have similar habits. 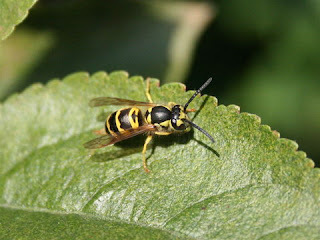 The German yellowjacket especially is a recent and aggressive invader, and is overtaking the eastern yellowjacket as the dominant species in this area. Yellowjackets are very beneficial insects -- they are mostly insectivorous and they feed on the larvae of blowflies, houseflies, beetles and many insects that harm ornamental and edible plants. Unless a nest is located in an inconvenient location, we should leave them alone and let them get on with helping to keep the garden free of harmful insects. As everyone knows, yellowjackets can become aggressive if they or their nests are disturbed. They prefer not to sting but will do so if provoked. A yellowjacket sting is unpleasant for most people and can be serious for those who are allergic. So, don't look for trouble. Don't go near suspected nests, and don't flap your arms if they start coming close. If yellowjackets become aggressive and start making trouble when you are in the garden, you may need to resort to spraying the colony. This should be a last resort in our relationship with these social and beneficial insects.